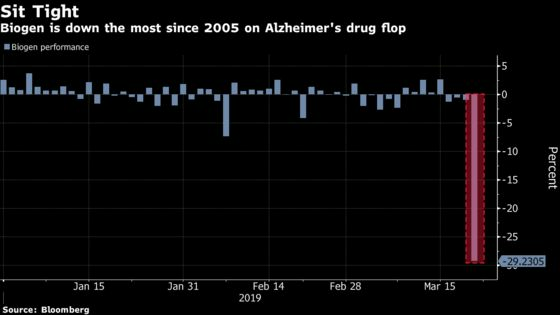 (Bloomberg) -- When Stifel analyst Paul Matteis downgraded Biogen to a hold rating in February, he cautioned that confidence in the company’s experimental Alzheimer’s drug was decreasing. Exactly a month later, that call looks prescient as Biogen lost more than a quarter of its market value Thursday after saying the drug was unlikely to be effective and research will be halted. That spurred at least 10 analysts to lower their recommendations from buy to hold in the biggest one-day cut in sell-side projections for any S&P 500 company since 2000, data compiled by Bloomberg show. That’s right, not even when Lehman went under in 2008, or when Microsoft fell 14% in one session in 2000, or after Facebook’s July sell-off did analysts walk back so many recommendations in sync. The last event that prompted an equally pronounced response was Apple’s 52% plunge in September 2000 after it warned that its quarterly profit would fall well short of estimates. There still may be more negative news to come for Biogen as we’ve already seen three additional downgrades overnight, including Morgan Stanley cutting the stock to sell. Dow futures are down 105 points pre-market and S&P 500 futures are lower by 0.4%, tracking weakness in Europe after the deepest slump in German manufacturing in over six years. Investors are on the lookout for March manufacturing data at 9:45 a.m. Economists expect it to rise to 53.5 from last month’s 53.0 print. Nike is down 4.1% pre-market after finishing the cash session at a record. Even though its quarterly EPS and gross margin beat estimates, softer-than-expected sales growth in North America pushed investors to hit the sell buttons. Tiffany is sinking 4.6% in early trading after saying a tough holiday season persisted into the rest of the fourth quarter. Biogen was the biggest drag on the S&P on Thursday, while Apple added the biggest boost. The S&P is now 2.6% from a record after an 1.1% advance on Thursday. 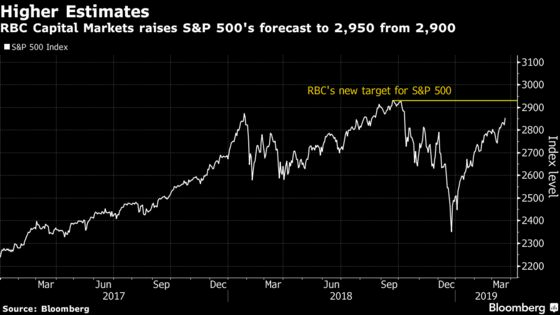 That pushed RBC Capital Markets’ Lori Calvasina to raise her 2019 target for the benchmark to 2,950 from 2,900, while giving a few cautionary warnings. U.S. equities face a “big test” in the second quarter, Calvasina said, because “for stocks to hang on to their YTD gains near-term and/or climb higher from here we think investors will need to see evidence that the economy is back on track relatively soon.” She joins Credit Suisse’s Jonathan Golub, who on Monday boosted his year-end forecast for the S&P 500 by 100 points to 3,025. Watch 10:00am existing home sales for signs of how the housing market fared in February, although that data’s less important than indicators about the spring selling season. RBC analyst Mike Dahl is staying cautious on homebuilder stocks heading into Lennar and KB Home earnings next week, as he fears investors have been focused on lower interest rates and adequate orders -- while overlooking higher land and labor costs, and buyers’ ability to afford new homes. Construction stocks also warrant attention ahead of the home sales data. JPMorgan said that it sees stronger Ebitda growth for building stocks compared with last year as it initiated its coverage of building firms Vulcan Materials and Martin Marietta Materials with overweight and Eagle Materials and Summit Materials with neutral. Apple is scheduled to unveil an original video programming service on Monday during a special event in California. The stock gained 3.7% on Thursday as three sell-side shops boosted their target prices on the stock (one of them, Needham’s Laura Martin, also upgraded the stock to strong buy from buy. Watch airlines on Wednesday as the U.S. Senate Commerce Committee holds a panel hearing on government oversight of airline safety. Boeing was down again on Thursday after two up days (and recall that Boeing warned that the grounding of Boeing’s 737 Max will start percolating through economic indicators from international trade to durable goods).